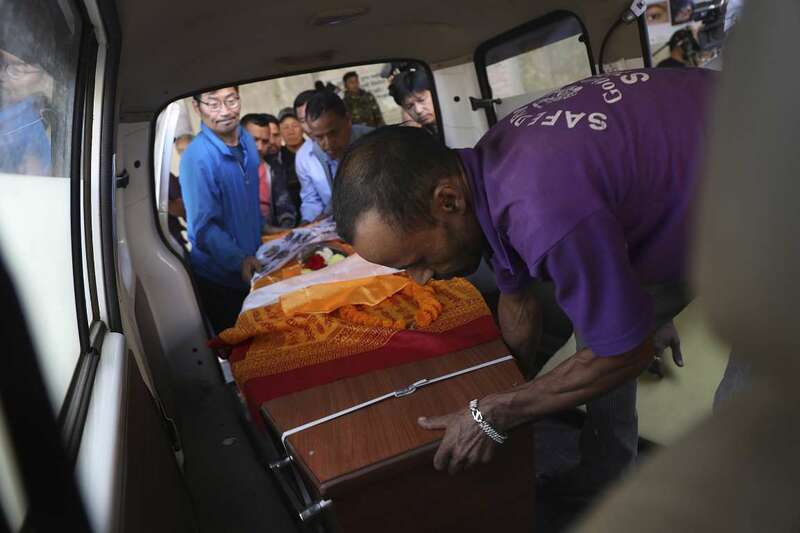 Relatives dressed in black funeral suits wept in grief as the bodies of five South Korean mountain climbers arrived home from Nepal where they had died in a storm last week. The caskets covered in white sheets were carried out from a terminal in Incheon International Airport early Wednesday. The five South Koreans and four Nepalese guides died when a storm swept the base camp on Gurja Himal on Friday night. The pristine mountain is rarely climbed, but the team's experienced leader had been focusing on untried routes in recent years. Team leader Kim Chang-ho in 2013 became first South Korean to summit all 14 Himalayan peaks over 8,000 meters (26,250 feet) without using supplemental oxygen.